The start of the LED solar lights for outdoor use was 1963. A lamp with a solar panel, rechargeable battery and LED lamp was used. The evolution has led to a fixture that can be very small. 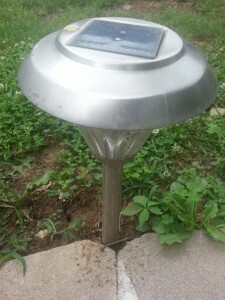 Most have a solar panel on the top of the fixture to capture the suns rays and a rechargeable battery somewhere in the base of the main fixtures. The LED lamp uses less energy than a regular bulb of the same brightness. The solar panel turns sunlight into energy to charge the battery. For more information on Solar Panels see my post here. The diode between the two will only let the energy go towards the battery. 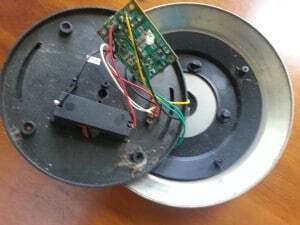 The energy from the battery is controlled by some kind of switch (light sensor for dusk to dawn, motion sensor or timer) to turn the current on and off to the LED bulb. The evolution of the switch has led to the current types, photo cell to function at dusk and dawn, motion sensor to turn on when something moves in front of it. The LED bulb is now small enough to have multiple bulbs in a pod that fits in the palm of your hand. The biggest drawback to this kind of light is that they are not replaceable by the homeowner. Once the bulb has expired then entire fixture is no good, the up side to this is the bulbs have a 30,000 hours life cycle with normal use. Batteries have changed since the first light. NiMH and LiPo batteries 1.2 volt and 3.2 volt are used in today's lights. Make sure that you check your voltage and miliamphours before purchasing replacement batteries. These can be changed with just removing a panel that covers the battery. Charge a new battery for several hours before light is needed. You can look at my article on Rechargeable Batteries in this post. Many types of fixtures are available for outdoor spaces today. 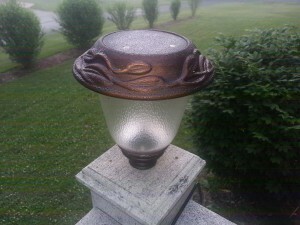 The post style is what most people think of when looking at solar outdoor lighting. Step, post top, flag post, spot, decorative, Umbrella or string lights are a few of the different styles that are available at most stores today. Around my home I have the post top on my deck post to give me enough light to use the deck at night an not draw too many bugs. I have several spot lights to illuminate some features in my garden area. Around a small patio area in the back yard, I have a set of six lights around the area to light it up after dark. 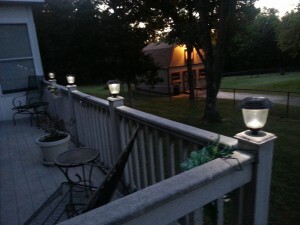 You may find many uses for LED solar lights for outdoor spaces. The ability to move them from place to place, no real maintenance or upkeep, having a single fixture make Solar fixtures the favorite for most homeowners now and into the future. If you have any questions, comments or something to add to this post, use the forms below. Thanks for your insight on LED solar light. I have had outdoor solar lights for a few years. I have found that some of them don’t seem to hold a charge very long and become dim or don’t work at all, which brand or type would you recommend for an outdoor setting? A lot of the power problems with solar lights are the amount of total sunshine they get daily. The quality of sunlight does make a difference. Look at my article on solar panels here as some produce power on less sun than others. Also the Mah power of the batteries does make some difference, look at my article about rechargeable batteries here. Sometimes the batteries that come with a new set of lights are not the best, replacing the original rechargeable batteries will sometimes solve this problem. If it does not check your solar panel for dirt or debris, even a little scum will effect the charge that you will receive daily. Look at my article about why my some of my solar lights do not work here. I am a fan of energy conservation and I have always welcome LED lights. I think LED lights really helped me to save more money and its power is also very efficient. One bad thing I can think of solar LEDs is when there is no sun, you cannot do anything about it. Just a question, how long can the energy be stored inside the LED? That would depend on a couple of items. First the size of the rechargeable battery. The second thing would be how you use your light. If you have it come on at dark and go off when the charge is depleted, then the light will not work the next day if it gets no sun. If you have a motion detector turning on your lights, they may last a few days on a good charge. Both methods will give you light when you need it. Also look at the solar panel design, some will charge even with a small amount of sunshine. Look at my post on solar panels here. In our country most of the people use solar to light in their houses but they don’t use outdoor solar light so am the luckiest person to get this information and outdoor light really impressed me because it also have a rechargeable battery, and i think it will fit if i placed it in my yard at the open space. Solar lighting is having a big surge in the outdoor area because of the low cost of production and operation. After the purchase there is very little running cost.